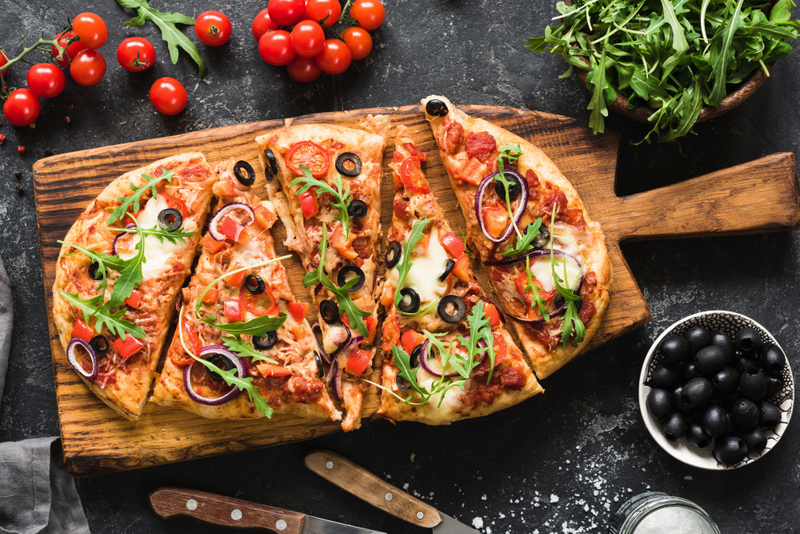 Pizza is meal everyone loves, especially when it’s homemade! This Gluten Free Flatbread Pizza is a meal everyone in the family can enjoy. Plus, it can easily be doubled to entertain a crowd. Just add your favorite pizza toppings! How do I store my Flatbread? Well, you’ll be surprised to have any left over- this flatbread pizza is delish! But, if you do happen to have leftovers, simply wrap in foil or an airtight container and place in the fridge for up to 48 hours. The longer in the fridge, the less quality you will have. Also, you can freeze flatbread for up to 1 month in an airtight container or freezer bag (#). This is great for planning meals ahead! To reheat, simply place back in the oven until warm, just about 10-15 minutes. First, Tomato Basil Pizza. All you need is pizza sauce, mozzarella, basil, and chopped tomatoes. Voila! Second, Veggies Galore. Top with pesto, mozzarella, olives, chopped onions (#5772), arugla, mushrooms, and sliced tomatoes. Third, Meat Lovers. Top with pizza sauce, mozzarella, pepperoni (#1596), crumbled bacon (#9137), crumbled sausage (#4041), ground beef (#2622), and parmesan cheese (#1683). Looking for more gluten free favorites? Gluten Free Flatbread Pizza is a meal everyone in the family can enjoy. Plus, it can easily be doubled to entertain a crowd. Just add your favorite pizza toppings! Your favorite pizza toppings! See above for ideas. First, in a small bowl, add sugar, yeast and warm water. Next, in the bowl of yeast and water, add olive oil. Pour into dry ingredients and mix. Then, cover the bowl with plastic wrap and allow to rise 30 minutes.